Irish Blog: EAT YOUR HEART OUT ! Prize for literature in 1995. Seamus Heaney (/ˈʃeɪməs ˈhiːni/; 13 April 1939 - 30 August 2013) was an Irish poet, playwright, translator, lecturer and recipient of the 1995 Nobel Prize in Literature. Born at Mossbawn farmhouse between Castledawson and Toomebridge, he resided in Dublinuntil his death. Other awards that Heaney has received include the Geoffrey Faber Memorial Prize(1968), the E. M. Forster Award (1975), the PEN Translation Prize (1985), the Golden Wreath of Poetry (2001), T. S. Eliot Prize (2006) and two Whitbread Prizes (1996 and 1999). He has been a member of Aosdána since its foundation and has been Saoisince 1997. He was both the Harvard and the Oxford Professor of Poetry and was made a Commandeur de l'Ordre des Arts et Lettres in 1996. Heaney's literary papers are held by the National Library of Ireland. On 6 June 2012, he was awarded the Lifetime Recognition Award from the Griffin Trust For Excellence In Poetry. Heaney was born on 13 April 1939, at the family farmhouse called Mossbawn, between Castledawson and Toomebridge in Northern Ireland; he was the first of nine children. In 1953, his family moved to Bellaghy, a few miles away, which is now the family home. His father, Patrick Heaney, was the eighth child of ten born to James and Sarah Heaney. Patrick was a farmer, but his real commitment was to cattle-dealing, to which he was introduced by the uncles who had cared for him after the early death of his own parents. Heaney's mother, Margaret Kathleen McCann, came from the McCann family, whose uncles and relations were employed in the local linen mill, and whose aunt had worked as a maid for the mill owner's family. The poet has commented on the fact that his parentage thus contains both the Ireland of the cattle-herding Gaelic past and the Ulster of the Industrial Revolution; he considers this to have been a significant tension in his background. Heaney initially attended Anahorish Primary School, and when he was twelve years-old, he won a scholarship to St. Columb's College, a Roman Catholic boarding school situated in Derry. 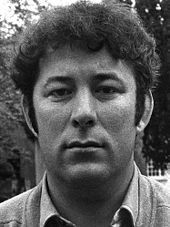 Heaney's brother, Christopher, was killed in a road accident at the age of four, while Heaney was studying at St. Columb's. The poems "Mid-Term Break" and "The Blackbird of Glanmore" focus on his brother's death. For more details on this part of Heaney's career, see his collections, Death of a Naturalist andDoor into the Dark. In 1957, Heaney travelled to Belfast to study English Language and Literature at Queen's University Belfast. During his time in Belfast, he found a copy of Ted Hughes's Lupercal, which spurred him to write poetry. "Suddenly, the matter of contemporary poetry was the material of my own life," he has said. He graduated in 1961 with a First Class Honours degree. During teacher training at St Joseph's Teacher Training College in Belfast (now merged with St Mary's, University College), Heaney went on a placement to St Thomas' secondary Intermediate School in west Belfast. The headmaster of this school was the writer Michael McLaverty from County Monaghan, who introduced Heaney to the poetry of Patrick Kavanagh. With McLaverty's mentorship, Heaney first started to publish poetry, beginning in 1962. Hillal describes how McLaverty was like a foster father to the younger Belfast poet. In the introduction to McLaverty's Collected works, Heaney summarised the poet's contribution and influence: "His voice was modestly pitched, he never sought the limelight, yet for all that, his place in our literature is secure." Heaney's poem Fosterage, in the sequenceSinging School from North (1975) is dedicated to him. In 1963, Heaney became a lecturer at St Joseph's and in the spring of 1963, after contributing various articles to local magazines, he came to the attention of Philip Hobsbaum, then an English lecturer at Queen's University. Hobsbaum was to set up a Belfast Group of local young poets (to mirror the success he had with the London group) and this would bring Heaney into contact with other Belfast poets such as Derek Mahon and Michael Longley. In August 1965 he married Marie Devlin, a school teacher and native of Ardboe, County Tyrone. (Devlin is a writer herself and, in 1994, published Over Nine Waves, a collection of traditional Irish myths and legends.) Heaney's first book, Eleven Poems, was published in November 1965 for the Queen's University Festival. In 1966, Faber and Faber published his first major volume, called Death of a Naturalist. This collection met with much critical acclaim and went on to win several awards, the Gregory Award for Young Writers and the Geoffrey Faber Prize.Also in 1966, he was appointed as a lecturer in Modern English Literature at Queen's University Belfast and his first son, Michael, was born. A second son, Christopher, was born in 1968. That same year, with Michael Longley, Heaney took part in a reading tour calledRoom to Rhyme, which led to much exposure for the poet's work. In 1969, his second major volume, Door into the Dark, was published. For more details on on this part of Heaney's career, see his collections, Wintering Out, North, Field Work and Selected Poems 1965-1975. After a spell as guest lecturer at the University of California, Berkeley, he returned to Queen's University in 1971. In 1972, Heaney left his lectureship at Belfast and moved to Dublin in the Republic of Ireland, working as a teacher at Carysfort College. In 1972, Wintering Out was published, and over the next few years Heaney began to give readings throughout Ireland, Britain, and the United States. In 1975, Heaney published his fourth volume, North. Also published was Stations. He became Head of English at Carysfort College in Dublin in 1976. His next volume, Field Work, was published in 1979. Selected Poems 1965-1975 and Preoccupations: Selected Prose 1968–1978 were published in 1980. When Aosdána, the national Irish Arts Council, was established in 1981, Heaney was among those elected into its first group (he was subsequently elected a Saoi, one of its five elders and its highest honour, in 1997). Also in 1981, he left Carysfort to become visiting professor at Harvard University, where he was affiliated with Adams House. He was awarded two honorary doctorates, from Queen's University and from Fordham University in New York City (1982). At the Fordham commencement ceremony in 1982, Heaney delivered the commencement address in a 46-stanza poem entitled Verses for a Fordham Commencement. As he was born and educated in Northern Ireland, Heaney has felt the need to emphasise that he was Irish and not British. Following the success of the Field Day Theatre Company's production of Brian Friel's Translations, Heaney joined the company's expanded Board of Directors in 1981, when the company's founders Brian Friel and Stephen Rea decided to make the company a permanent group.In 1984, his mother, Margaret, died. For more details on on this part of Heaney's career, see his works, Station Island, The Haw Lantern, The Cure at Troy and The Spirit Level. Heaney was Boylston Professor of Rhetoric and Oratory at Harvard University (formerly Visiting Professor) 1985–1997 and Ralph Waldo Emerson Poet in Residence at Harvard 1998–2006. In 1986, Heaney received a Litt.D. from Bates College. His father, Patrick, died soon after publication of the 1987 volume, The Haw Lantern. In 1988, a collection of critical essays called The Government of the Tongue was published. In 1989, Heaney was elected Professor of Poetry at the University of Oxford, which he held for a five-year term to 1994. The chair does not require residence in Oxford, and throughout this period he was dividing his time between Ireland and America. He also continued to give public readings; so well attended and keenly anticipated were these events that those who queued for tickets with such enthusiasm have sometimes been dubbed "Heaneyboppers", suggesting an almost teenybopper fanaticism on the part of his supporters. Heaney was named an Honorary Patron of the University Philosophical Society, Trinity College, Dublin and was elected an Honorary Fellow of the Royal Society of Literature (1991). In 1993, Heaney guest-edited The Mays Anthology, a collection of new writing from students at the University of Oxford and University of Cambridge. In 1990, The Cure at Troy, a play based on Sophocles's Philoctetes, was published to much acclaim, followed by Seeing Things in 1991. Heaney was awarded the Nobel Prize in Literature in 1995 for what the Nobel committee described as "works of lyrical beauty and ethical depth, which exalt everyday miracles and the living past". He was on holiday in Greece with his wife when the news broke and no one, not even journalists or his own children, could find him until he appeared at Dublin Airport two days later, though an Irish television camera traced him to Kalamata. Asked how it felt having his name to the Irish Nobel pantheon featuring William Butler Yeats,George Bernard Shaw and Samuel Beckett, Heaney responded: "It's like being a little foothill at the bottom of a mountain range. You hope you just live up to it. It's extraordinary." He and Marie were immediately whisked straight from the airport to Áras an Uachtaráin for champagne with the then President Mary Robinson. Heaney's 1996 collection The Spirit Level won the Whitbread Book of the Year Award and repeated the success with the release ofBeowulf: A New Translation. For more details on on this part of Heaney's career, see his works, The Burial at Thebes, Beacons of Bealtaine, District and Circle and Human Chain. In 2003, the Seamus Heaney Centre for Poetry was opened atQueen's University Belfast. It houses the Heaney Media Archive, a record of Heaney's entire oeuvre, along with a full catalogue of his radio and television presentations. That same year Heaney, decided to lodge a substantial portion of his literary archive at Emory University, as a memorial to the work of William M. Chace, the university's recently retired president. The Emory papers represented the largest repository of Heaney's work (1964–2003), donated to build their large existing archive from Irish writers including Yeats, Paul Muldoon, Ciaran Carson, Michael Longley and other members of the The Belfast Group. In 2003, when asked if there was any figure in popular culture who aroused interest in poetry and lyrics, Heaney praised rap artistEminem, saying "He has created a sense of what is possible. He has sent a voltage around a generation. He has done this not just through his subversive attitude but also his verbal energy." He composed the poem "Beacons of Bealtaine" for the 2004 EU Enlargement. The poem was read by Heaney at a ceremony for the twenty-five leaders of the enlarged European Union arranged by the Irish EU presidency. Heaney suffered a stroke from which he recovered in August 2006, but cancelled all public engagements for several months. He was in County Donegal at the time on the occasion of the 75th birthday of Anne Friel, playwright Brian Friel's wife. He read the works ofHenning Mankell, Donna Leon and Robert Harris while in hospital, and was visited at the time by Bill Clinton. Heaney's District and Circle won the 2006 T. S. Eliot Prize. He became artist of honour in Østermarie, Denmark in 2008 and the Seamus Heaney Stræde (street) was named after him. In 2009, Heaney was presented with an Honorary-Life Membership award from the UCD Law Society, in recognition of his remarkable role as a literary figure. Faber and Faber published Dennis O'Driscoll's bookStepping Stones: Interviews with Seamus Heaney in 2008; this has been described as the nearest thing to an autobiography of Heaney. In 2009, Heaney was awarded the David Cohen Prize for Literature. He spoke at the West Belfast Festival 2010 in celebration of his mentor, the poet and novelist Michael MacLaverty, who had helped Heaney to first publish his poetry. In 2010, Faber published Human Chain, Heaney's twelfth collection. Human Chain was awarded the Forward Poetry Prize for Best Collection, one of the only major poetry prizes Heaney had never previously won, despite having been twice shortlisted. The book, published 44 years after the poet's first, was inspired in part by Heaney's stroke in 2006 which left him "babyish" and "on the brink". Poet and Forward judge Ruth Padel described the work as "a collection of painful, honest, and delicately weighted poems...a wonderful and humane achievement". Writer Colm Tóibín described Human Chain as "his best single volume for many years, and one that contains some of the best poems he has written... is a book of shades and memories, of things whispered, of journeys into the underworld, of elegies and translations, of echoes and silences." In October 2010, the collection was shortlisted for the T. S. Eliot Prize. “Be advised my passport's green.